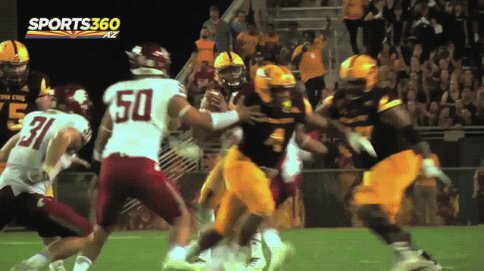 Give me Arizona State vs Iowa State in any bowl game and I will be very pleased with the 2018 post season. Have you seen what former Perry high school quarterback Brock Purdy has done for the Cyclones? He’s burst on the national scene in such a way that he’s already being billed by many as the top freshman at his position in the country. This past weekend Purdy became Iowa State’s single-season record holder for most touchdown passes by a freshman with 12. Since taking over as the starter the team is averaging 36-points per game.The Cyclones are 4-0 in that span,with strong wins over Oklahoma State, West Virginia and Texas Tech. What makes his story even better is the Cyclones have a terrific receiver, Hakeem Butler, who makes acrobatic plays most every week. The two are a terrific tandem to watch. In my circles, Iowa State has become “must see TV” on Saturdays. Eleven months ago, a friend asked me if I would call Purdys father Shawn. At the time Brock was getting very little college interest. The father asked me about junior college options for his son. You see, I usually get the “My kid should be getting offers from Alabama, Texas [email protected], blah, blah blah”. So I’ve been all in on Brock Purdy since that day. It worked out for him in a big way. His story should be told over and over to parents who are going to go through the recruiting process. Just because the hometown university doesn’t call, doesn’t mean you can’t make your mark nationally elsewhere.